Lovaii Navlakhi, certified financial planner, says the early-bird advantage can give the couple, Suhas and Sheetal a headstart with higher equity allocations. Newly-weds, Suhas K.M,28, and Sheetal, 27, from Bangalore are both IT professionals. Like any Indian couple, buying a house, planning for their child's education and wedding are part of their financial goals. Both Suhas and Sheetal like to travel and are planning to go on a foreign trip next year. Though their family goals are well thought out, given the current financial situation, they need to cut back a bit on their plans of buying a house. Suhas is an aggressive investor, but he must buy a personal health plan and a life cover, in addition to the health insurance cover provided by his company. The couple brings home an annual salary of Rs. 8.64 lakh, while their annual expenses, including insurance premiums, amount to Rs. 3.61 lakh. Given the current financial situation, they might have to consider scaling down their near-term goal of buying a house. However, financial planning is not a one-time exercise; yearly reviews will help you know if the goal can be increased or not. It is recommended that 3-6 months of expenses should be maintained as an emergency corpus at all times. For now, it has been earmarked at Rs. 90,000. The goal to purchase a property in 2020 for Rs. 50lakh (today's value) has been scaled down to Rs. 45 lakh. This has been done so that the accumulated assets till date, projected savings and the income generated is not majorly used to service the property loan. The debt servicing ratio (proportion of your EMI payments serviced from your income) should not be high. Would be good to review the situation once again a few years after the property is purchased - to take stock of the situation then and, if there is a possibility, consider revising the goal value. Currently, for the purchase of a house, 30 per cent of the house value is recommended to be paid as down payment and the rest to be funded through a loan. The corpus required at the time of retirement for your post retirement needs has been bifurcated into two main component - monthly expense requirement and post retirement vacation. Earmarked an annual expense of Rs. 50,000 for post-retirement vacation needs for 20 years. The goals for the child can be met in full. The expected increase in income for this year (2017) has been taken at 8 per cent for both. However, for the next few years it is important that Suhas maintains an annual income growth rate of 7 per cent (from 2018 until 2021). With a new member in the family in the near future, overall expenses will increase. 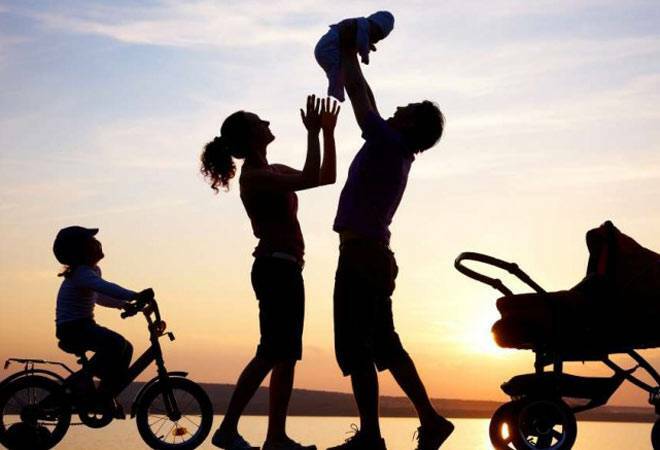 Since the maternity benefits are covered under the corporate health insurance plan, there is no specific need to create a separte corpus for the same. However, maintaining an emergency corpus to take care of any unforseen requirements is recommended. An additional increase of 10 per cent for household expenses from 2018 has been taken into account. However, it is important that the expenses are reviewed to the actual expenses to realign the savings and investments. Risk profiling is an important element of investment planning. The purpose of saving and duration of investment are one side of the coin, while understanding one's willingness to be exposed to riskier asset classes is another. It is important to strike the right balance to arrive at an appropriate investment strategy and asset allocation that may vary from person to person. Suhas is an aggressive investor, therefore, the allocation being considered is 60 per cent in growth and 40 per cent in stable asset class. 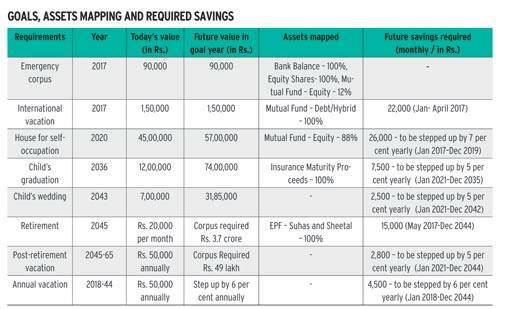 Important to invest all available savings into a combination of assets yielding returns of 10 per cent p.a. to achieve long-term goals. Considering that in 2020, there is a heavy payout in the form of down payment for a self-occupied house, the focus should be to invest a major part of your surplus in a less volatile asset class and to ensure that the funds can be liquidated any time over the next few years. Currently, investments in growth assets are about 70 pe cent. With plans of purchasing a home in the next four years, its recommended to reduce exposure towards growth assets. For the next few years, an allocation of 30-40 per cent to growth assets can be considered until your house purchase; after that it can be increased. For the property goal, recommended investments could be in hybrid or balanced mutual funds and debt funds. With a view on the current taxibility on Suhas' income; fixed deposits and recurring deposits can also be considered. Your savings rate is healthy at 55 per cent. A good savings rate along with a prolonged accumulation phase are major drivers in building the required corpus. Focus on systematic future investments of surplus income to meet your goals. Build a well-diversified financial asset portfolio to manage liquidity and portfolio growth. On existing personal insurance, continue paying premiums. Additional life cover is recommended to ensure the family continues to maintain similar lifestyle in case anything was to happen to Suhas or Sheetal. Insurance Requirement is calculated after taking into account the requirement for expense protection, goal protection and liability protection. Based on the details provided, additional life cover must be of Rs. 1.2 crore for Suhas and Rs. 1 crore for Sheetal. We recommend a pure-term plan. With increase in income Suhas can increase the insurance cover later. Important to have adequate personal and critical illness covers. For now, critical cover of Rs. 10 lakh and a personal accident cover of Rs. 25 lakh is recommended for both. Benefi ts under Section 80C are being availed through life insurance premiums and EPF contributions. Section 80D benefi ts can be availed once the health and critical insurances are purchased. Recommend an estate plan to safeguard interests of dependents. Life Insurance is not aligned to current requirement. High dependency on corporatesponsored health cover. 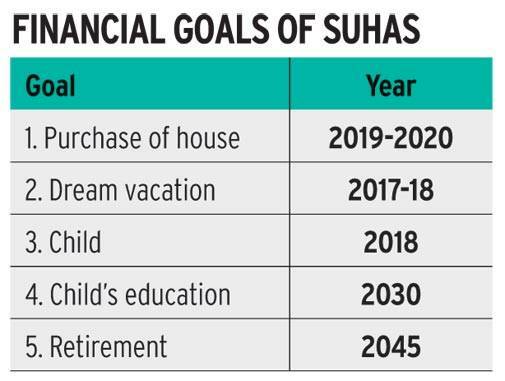 It is imperative that Suhas's salary grows at 7 per cent per annum till 2021, and at 5 per cent every year, after that, and till retirement) to realise the stated goals. Savings plan will require a judicious approach, actuals should be aligned with budgeted expenses. Advisable not to link insurance protection with investments. It's of paramount importance that the portfolio grows at 10 per cent p.a until retirement. It is extremely important to understand the risk appetite while planning investments, which should be aligned to the requirements. Until the house purchase is complete, savings need to be diverted more towards stable asset classes. After that, exposure in growth assets can be increased aligned to the risk profile. The income generated by you should not be used majorly for EMI payments. The debt servicing ratio (proportion of your EMI payments being serviced from your income) is a critical component and must not be ignored while fi nalising the loan amount.